Cold weather is back and if you have fortitude, you will go out and shoot in the frozen light of Winter. Animals are slow, easier to approach (but limit yourself to reasonable distances to avoid frightening the animals out of their nest; By this weather, it could be a death sentence on your conscience). Landscapes are hidden in fog or covered by snow. Ski holidays are often the excuse you needed to shoot new pictures of friends and family, even if your models will try to cover themselves with as much cloth as possible. So, let’s not forget the basic advice for the photographer in cold weather and we’ll bring good pictures back from the near-Arctic zone of our holidays. Protection against mist and water vapor: Cold generates mist any time hardware moves quickly from one place to another one, violently changing temperature. In a house, it’s warm with a lot of humidity; Outside, it’s cold and the air is dry. Use a plastic bag for freezing food. You’ll close the camera and lenses with outside dry air before getting back in. Don’t forget to remove the battery and/or memory card on the doorstep, of course. Protection against snow: As for rain, you must be wary of the bad consequences of humidity directly one the photo equipment. If the camera is weather-sealed, you’ll forget about it, mostly. But, if not, don’t let snow fall onto it. It’s so much nicer, but it will short-circuit electrical contacts in about the same time. Electrical storage: Be prepared: You need more batteries. In the cold temperatures, all batteries seem to loose a lot of their autonomy. It is advisable to keep unused batteries near your body (for body heat), but above all double all your habits for additional energy storage. You need twice the spare batteries. Protection of the photographer: Hardware is not the only one sensitive to cold. The software photographer also gets cold. Remember to always be clothed more than adequately. You will not shoot good pictures if your are frozen to immobility and get a cold. Remember that it’s always more difficult if you are not moving for a long time. Protection of the photographer: More specifically, choose cautiously your gloves. They must be as warm as possible and as thin as possible (to keep a good finger sensitivity on the controls). You’ll find excellent technical products in shops specializing in outdoor and alpine sports. Don’t forget the light: This is the most common problem with snow, you must over-expose by 2 stops when snow is visible in the viewfinder. 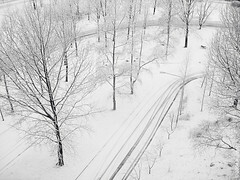 The metering sensor and system will try to render some kind of medium light grey color, and with all this white snow, it will strongly under-expose. You must compensate and OVER-expose. Snap nice frozen photos! And show us them on the Facebook page, or in the Flickr group.